Ship Building 1933-45 - Roosevelt, Franklin D.
Assuming the Presidency at the depth of the Great Depression, Franklin D. Roosevelt helped the American people regain faith in themselves. He brought hope as he promised prompt, vigorous action, and asserted in his Inaugural Address, "the only thing we have to fear is fear itself." Following the example of his fifth cousin, President Theodore Roosevelt, whom he greatly admired, Franklin D. Roosevelt entered public service through politics, but as a Democrat. He won election to the New York Senate in 1910. 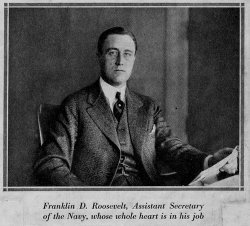 President Wilson appointed him Assistant Secretary of the Navy, and he was the Democratic nominee for Vice President in 1920. Roosevelt had pledged the United States to the "good neighbor" policy, transforming the Monroe Doctrine from a unilateral American manifesto into arrangements for mutual action against aggressors. He also sought through neutrality legislation to keep the United States out of the war in Europe, yet at the same time to strengthen nations threatened or attacked. By 1932, due to the continuance of building in the interval by the other Powers the relative naval inferiority of the United States has increased rather than decreased. The Navy recommended a large building program to correct this deficiency. The destroyer force faced the end of the service life for all but five destroyers by the end of 1936, if no new destroyers were laid down. The Board recommended building four 1850-ton destroyers and twenty 1500-ton destroyers in fiscal year 1934, and at least four 1850-ton destroyers again in 1935. By 1934, the policy of the National Government with regard to the Navy had materially and visibly changed. As is well known, the United States, which had voluntarily limited the size of its fleet by the treaty of 1922, had gone a step further and refrained from building up to the size allowed by the agreement. The Roosevelt Administration, dating from March 4, 1933, from the double motive of aiding national defense and stimulating industry, decided to build up to the top limit. Congress responded by appropriating $3.3 billion under the National Industrial Recovery Act (NIRA). The administration then turned around and provided the Navy a $237 million slice of the total for warship construction. The Navy immediately let contracts to build 20 sorely needed destroyers, four submarines, four light cruisers, and two aircraft carriers-one of them the conventionally powered USS Enterprise of World War II fame. When France fell and England came under siege in 1940, he began to send Great Britain all possible aid short of actual military involvement. When the Japanese attacked Pearl Harbor on December 7, 1941, Roosevelt directed organization of the Nation's manpower and resources for global war. At the end of 1933, the U.S. Navy consisted of 372 ships, displacing 1,038,660 tons -- 150,000 tons short of the treaty limitations. As an indication of Congress's and Roosevelt's concern over the Far Eastern situation, the Trammel-Vinson Act passed the Senate on March 27, 1934. The Vinson-Trammell Act stands as one of the most significant measures in American naval history. The President signed the Trammel-Vinson Act, which established the strength of the Navy and authorized the construction of vessels and aircraft to replace units as they became overage. The Trammell-Vinson Act provided for the replacement of obsolete vessels by new construction and a gradual increase of ships. Vinson-Trammell Act authorized -- though it does not fund -- Navy construction to Treaty strength. Initial funding for the Vinson-Trammell Navy Act was provided by the Emergency Appropriations Act of 1934. The law authorized the construction of 65 destroyers, 30 submarines, one aircraft carrier, and 1184 naval airplanes, to be started over the next three years and completed by 1942. The act included the provision that alternate ships be built in navy yards, and it mandated that government arsenals provide the necessary ordnance. The bill also approved building the six cruisers still remaining from the 1929 program: four for 1935 and two for 1936. The Vinson-Trammell Act was enacted on March 27, 1934 (Pub. L. 73-135, 48 Stat. 503) as a part of the response of Congress to the President's request for authority and funds to build the Navy up to the levels permitted by the various international arms treaties and to safeguard appropriated public funds by placing a limitation on the amount of profit a contractor or subcontractor could make from the construction or manufacture of all or part of any complete naval vessel where the amount of the contract or subcontract involved is $10,000 or more. A brief glance at world conditions at the time will show that this rearmament trend came not a moment too soon. With Hitler already, installed in power, Nazi Germany at once became a threatening potential. Italy talked of aggression and had already cast covetous eyes on Ethiopia. Japan, having seized Manchuria and adjoining provinces of China, threatened to continue her career of conquest, and was now in every way an uncomfortable trans-Pacific neighbor. Within a year this policy could be seen reflected in institutions within the Navy. Altogether, the Naval Construction Program then undertaken by the United States involved 70 vessels of every category limited by the treaties. About 30 months, it was estimated, would be required to complete the construction, at the end of which time the Nation's sea strength would still fall short, by 78 ships, of the potential allowed by the Naval agreement. Whereas the Five-Year Program had set a specific limit on the number of aircraft for the Navy's air arm, the Vinson-Trammell Act called for the number of operational aircraft to grow proportionally along with the number of battleships, cruisers, and aircraft carriers in the fleet. This alleviated the need for later additions to the program to provide for subsequent expansion of the fleet. As each new ship was due to enter service, a corresponding increase in the aircraft inventory was automatically authorized. By 1934, 15 new cruisers and one aircraft carrier - the USS Ranger - had been commissioned but, under the Five-Year Program, had not been provided aircraft complements. These unsatisfied requirements totaled over 200 aircraft, and the Vinson-Trammell Navy Act authorized the immediate expansion of the aircraft inventory to accommodate these demands. The report by the Secretary of the Navy for 1935 shows the condition of the fleet then and the immediate plans regarding expansion. To the Trammel-Vinson Act, Congress had added a sizable appropriation, which would permit the continuance of construction begun under earlier allocations and would also allow 24 additional keels to be laid. The manufacture of guns had gone on, evidently with some rapidity. Considerations of security had already begun to operate, however, because the Secretary this time purposely omitted stating the number of each caliber turned out. The guns ranged from 5-inch 25's to 16-inch 45's, with accessories, such as breech plugs, mounts, sights, gun directors, and torpedo tubes. In 1936, Congress authorized the construction of six new cruisers and two large aircraft carriers - the USS Yorktown and USS Enterprise. Combined with the already outstanding aircraft requirements, the new fleet requirements stood at 273 new aircraft, all of which were automatically approved under the Vinson-Trammell Navy Act. The flexibility provided by the Vinson-Trammell Navy Act proved extremely valuable during the fleet's expansion program. The Bureau of Aeronautics estimated that by 1940, it would require some 2,000 aircraft to outfit the growing fleet, including those required for the new vessels planned under the current expansion program. The Congressional Appropriation Act for 1937 provided preliminary plans for two new battleships, and work on them began the following year. A similar act in 1938 provided for eight destroyers and four submarines, while by a special piece of legislation, at about the same time, Congress permitted the replacement of two overage battleships by new ones. The purpose of all this building, in line with the original provisos of the Trammel-Vinson Act, was to increase by 20 percent the under-age strength of the U.S. Navy. In 1938 Congress passed President Roosevelt's Naval Expansion Act. This act called for across-the-board increases of 20 percent in the Navy's fleet strength. The aircraft inventory was likewise authorized to grow to a strength of not less than 3,000 planes by 1945. Of course all these new planes would require pilots and basing facilities, both of which were authorized in this important act. By this time, it had become clear to leadership in the Navy and in Congress that it was futile to attempt to expand naval aviation operations without a corresponding expansion of the infrastructure that was necessary to support them. On 20 May 1938 Chairman Carl Vinson (D. Ga.) of the House Naval Committee, apparently with administration support, advocated an immediate appropriation for 12 ships, a dirigible and a "mosquito fleet" authorized by the billion-dollar Naval Expansion Act. The vessels include two light cruisers and a 20,000-ton aircraft carrier. The other nine are auxiliary ships - the category is which the Navy is most deficient. Two light cruisers mounting six-inch guns, $44,000,000; a large seaplane tender, $12,000,000; two small seaplane tenders, $3,000,000; a mine layer, $5,000,000; a mine sweeper, $1,500,000; two oil tankers, $15,000,000; two fleet tugs, $4,000,000; an aircraft carrier, $22,000,000; a 3,000-cubic foot rigid airship, $3,000,000 and an indefinite number of speedy, experimental torpedo boats, $4,500,000. The aircraft carrier - the seventh modern ship of its type in the fleet or under construction - cannot be laid down before 1939, Representative Vinson said. Money appropriated before Congress adjourns, however, would allow the Navy to perfect specifications and order materials. (a) Aircraft carriers, seventy-nine thousand five hundred tons, making a total authorized under-age tonnage of two hundred and fifty-four thousand five hundred tons. (b) Cruisers, sixty-six thousand five hundred tons, making a total authorized under-age tonnage of four hundred and seventy-nine thousand and twenty-four tons. (c) Submarines, twenty-one thousand tons, making a total authorized under-age tonnage of one hundred and two thousand nine hundred and fifty-six tons: Provided, That the foregoing total tonnage for aircraft carriers, cruisers, and submarines may be varied by thirty-three thousand four hundred tons in the aggregate so long as the sum of the total tonnages of these classes as authorized herein is not exceeded: Provided further, That the terms used in this or any other Act to describe vessels of designated classes shall not be understood as limited or controlled by definitions contained in any treaty which is not now in force. SEC. 3. The President of the United States is hereby authorized to acquire or construct naval airplanes, and lighter-than-air craft, and spare parts and equipment, as may be necessary to provide and maintain the number of useful naval airplanes at a total of not more than four thousand five hundred, including five hundred airplanes for the Naval Reserve; and the number of useful nonrigid lighter-than-air craft at a total of not more than eighteen. SEC. 4. The President of the United States is hereby further authorized to acquire and convert or to undertake the construction of seventy-five thousand tons of auxiliary vessels of such size, type, and design as he may consider best suited for the purposes of national defense. SEC. 5. There is hereby authorized to be appropriated, out of any money in the Treasury of the United States not otherwise appropriated, such sums as may be necessary to effectuate the purposes of this Act, including not to exceed $35,000,000 for shipbuilding ways, shipbuilding docks and essential equipment and facilities at naval establishments for building or equipping any ship, herein or heretofore authorized, and, in addition, not to exceed $6,000,000 for essential equipment and facilities at either private or naval establishments for the production of armor or armament: Provided, That equipment and facilities procured for the production of armor or armament pursuant to the authority contained herein may be leased, sold, or otherwise disposed of, in the discretion of the Secretary of the Navy, when no longer required for use under naval contract. SEC. 6. The allocation and contracts for construction of the vessels herein authorized as well as the procurement and construction of airplanes and spare parts, shall be in accordance with the terms and conditions provided by the Act of March 27, 1934 (48 Stat. 503), as amended. SEC. 7. Vessels of the following categories shall hereafter he deemed under age until the number of years indicated have elapsed since completion: Battleships, twenty-six years; aircraft carriers and cruisers, twenty years; other combatant surface craft, sixteen years; submarines, thirteen years. SEC. 8. The construction, alteration, furnishing, or equipping of any naval vessel authorized by this Act, or the construction, alteration, furnishing, or equipping of any naval vessels with funds from any appropriation available for such purposes, contracts for which are made after June 30, 1940, shall be in accordance with the provisions of Public Law Numbered 846, Seventy-fourth Congress, approved June 30, 1936, unless such course, in the judgment of the President of the United States, should not be in the interest of national defense. SEC. 9. For the purpose of modernizing the United States ships New York, Texas, and Arkansas, alterations and repairs to such vessels are hereby authorized at a total cost not to exceed the sum of $6,000,000. This sum shall be in addition to the total appropriation expenditures for repairs and changes to each of these vessels as limited by the Act of July 18, 1935 (49 Stat. 482; U. S. C., title 5, SEC. 468a). SEC. 10. The provisions of section 4 of the Act approved April 25, 1939 (53 Stat. 590,592), shall, during the period of any national emergency declared by the President to exist, be applicable to naval public works and naval public utilities projects in the Fourteenth Naval District for which appropriations are made or authorized: Provided, That the fixed fee to be paid the contractor as a result of any contract entered into under the authority contained herein, or any contract hereafter entered into under the authority contained in said Act of April 25, 1939, shall not exceed 6 per centum of the estimated cost of the contract, exclusive of the fee, as determined by the Secretary of the Navy. SEC. 11. In the discretion of the President, there is hereby authorized and established a Naval Consulting Board of seven members to be appointed by the President, by and with the advice and consent of the Senate, from among eminent civilians in the fields of industry, science, and research, to serve during the pleasure of the President. This Board is hereby authorized to make recommendations to the Secretary of the Navy in any matter concerning the Naval Establishment and the national defense. The members thereof shall serve without compensation, but shall be reimbursed for all expenses incurred incident to their travel and employment as members of the Board. There is hereby authorized to be appropriated out of any money in the Treasury not otherwise appropriated, not to exceed $25,000 to effectuate the purposes of this section. On 19 July 1940 President Franklin D. Roosevelt signed the second Naval Expansion Act, an act to establish the composition of the United States Navy, to authorize the construction of certain naval vessels, and for other purposes. The Two-Ocean Naval Expansion Act meant 7 new battle ships, 18 carriers, 29 cruisers, 115 destroyers and 42 submarines to add to the fleet. SEC. 4. The allocation and contracts for construction of the vessels herein authorized shall be in accordance with the terms and conditions provided by the Act of March 27, 1934 (48 Stat. 503), as ammended.